Yep, didn't see the PS with the specifications. ??? Do you all have only 6 year old PC's ??? I have my PC since May or June 2004 (can't remember), and except a new 19" CRT and a new graphic card (has the same chipset as the card I had, so the speed is the same. I thought the old one were broken, but it wasn't. Now I have 2 Radeon 9800 Pro cards, one from Ati (dont' use it), and one from MSI (use it, the RX9800Pro TD-128. What a mess. Paid 200Euro for it. *cry*) I bought no new PC parts (oh! except a new MSI 16x DVD drive, the old one was waaaaaay to loud)!! Everything works fine on it! The only new stuff I'm going to buy is a Everglide Mousepad and this new optical mouse with 1600dpi from Razor. And your PC's? All from 2002 or what? ?_? I used a camera to film the movie from my monitor. It's small, compressed (but still lookin' good) and has poor sound, but it's only 4Mb large!! I compressed it using ZIP compression, so be sure the a unZIP app on your PC. The intro simply rocks the s**t out of you, I tell ya! Since this is not my webspace I'm using, I'll delete this ZIP file after 2days (or even only 1!) from the server. So HURRY UP and download it! You simply HAVE TO see his fu**ng kewl movie! Thanks. I downloaded your movie and it's very exciting. Moreover, with the soldier who sacrifice himself for waving his flag. This is excellent. I feel like doing to play at this game. EDIT: He is no normal soldier. Normal Space Marines wear full sealed Servor Armor and a heavy Bolter (or Flamethrowers, Plasma Gun's, etc.- heavy weapons), unit's without hemlets are special ones, like Captain's and/or Sergenant's. Did you saw it? He is equiped with a Chain Sword and a Handbolter, so he's a Sergeant- the Squad Leader. Seiryo -> Did you play to warhammer 40K Tabletop battle game before to play with the computer game? However, of course I did! But my 1st Warhammer (and favorite) table top game was the real Warhammer, Warhammer Fantasy. 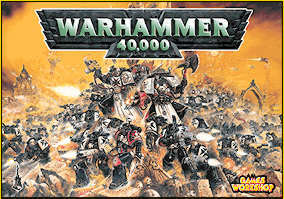 I bought the W40K soon after I bought Wfantasy. I never played Warhammer Epic 40K, Mordheim, Gorkamorka, Star Fleet Gothic, or one of the other table top games series from Games Workshop yet. It's really expensive, the Games Workshop (Citadel miniatures) hobby, so I quit playing the games or even to paint the figures years ago. I even have some White Dwarf magazines somewhere... really kewl this official magazine from Games Workshop. Hah!! This reminds me of these kewl videos of Final Liberation (1997). REAL actors in Space Marines and Orc costumes. Way kewl!! And music was very, very good, too. I'll now post some pictures of the videos of Final Liberation. You are right, this hobby is very very expensive and it takes a lot of time to paint an army. Yeah... but only because the colors and figures are so expensive. Over 2Euro for just a single tiny color. Awww.